To give our readers better insight into the global mobile games industry we’ve teamed up with market data firm Sensor Tower to bring you brand new, exclusive weekly charts from key countries. 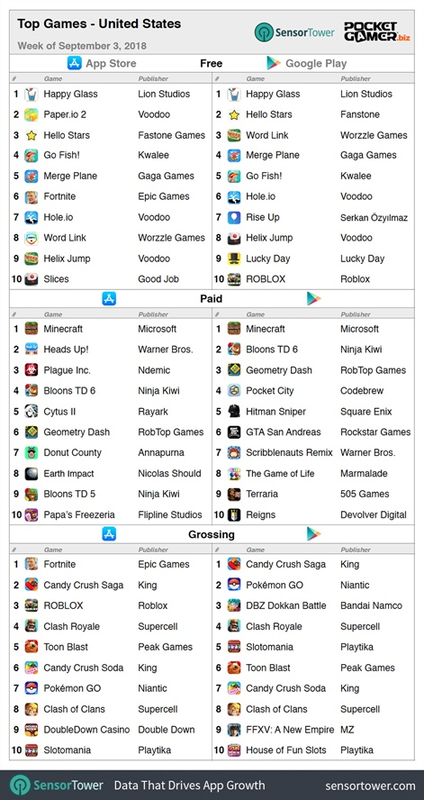 These rank games by free downloads, paid downloads and the top grossers across the App Store and Google Play. Each week we’ll be covering the US, Great Britain and Ireland, and China (iOS only) markets. In future charts we’ll also list the movers so you can see who’s riding high and who’s falling away week-on-week. Got any feedback on the new charts? Email PocketGamer.biz senior editor Craig Chapple at craig.chapple@steelmedia.co.uk. Our first charts cover the week commencing September 3rd to 9th. For the week starting September 3rd, AppLovin’s new publishing division Lion Studios topped the App Store and Google Play free download rankings with casual title Happy Glass. The game tasks players with drawing lines to fill a glass with water. Voodoo dominates the download rankings, with three games in the top 10 on iOS and two in the Google Play top 10. Over in the top grossing meanwhile, Fortnite reigns supreme on the App Store - but is of course missing from Google Play due to Epic’s decision to circumvent it in favour of its own launcher. Casino games Slotomania and DoubleDown Casino have taken ninth and 10th spots on the App Store grossing positions, while Slotomania fared better on Google Play in fifth. Lion Studios topped both the App Store and Google Play free download charts once again in Great Britain and Ireland. Voodoo also dominated in the region, with three games in the App Store and Google Play top 10 rankings. 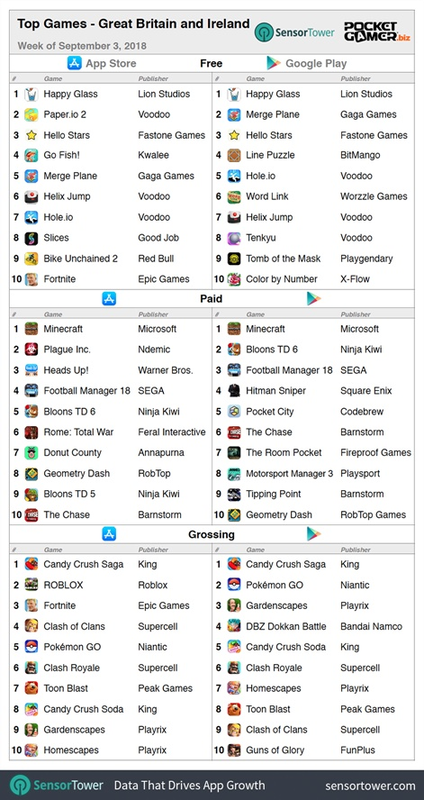 Candy Crush Saga has generated the most IAP revenue on both iOS and Android, with Fortnite in third spot on the App Store. Unlike the US, there were no casino games in the top 10 grossing positions. It’s a hattrick for Lion Studios - Happy Glass has proven a global success, topping the App Store free download chart in China and beating the likes of Tencent’s PUBG Battlegrounds and Honor of Kings. The top grossing game was that latter title though, with the hit MOBA seemingly unstoppable in China. 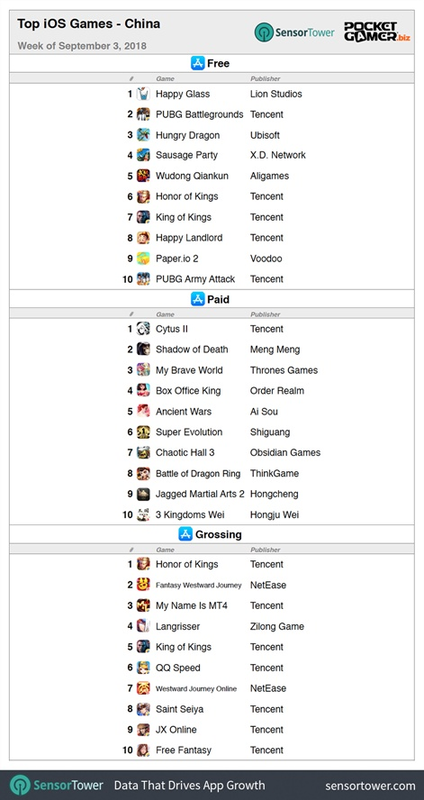 Tencent and NetEase took nine of the 10 top grossing positions, with Zilong Games’ Langrisser the only title published by another company.